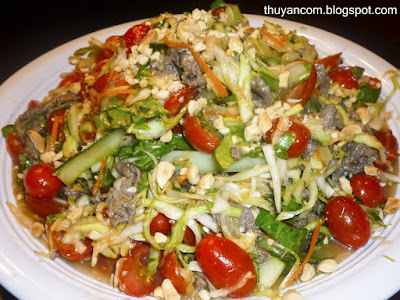 A fellow reader gave me a great tip to add cucumber and tomatoes to my Bo Tai Chanh recipe. Since I love both very much, I was glad to try it out. 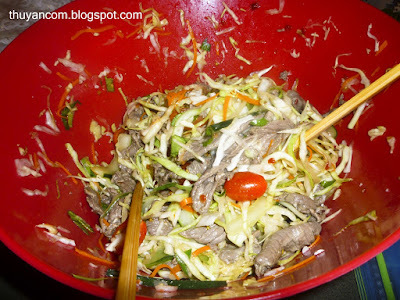 As I was picking up the ingredients at the grocery store I had this craving for "xa lach tron thi bo", sauteed sliced beef on a bed lettuce and tomatoes. I tend to do that a lot, change my dinner plan base just like that. Xa lach tron is one of my favorite dish to eat in the summer time because it's light but still has a lot of flavor. I thought it would be fun to turn it into a goi simply by using cabbage and a lot of fresh herbs. This is simply why I love to cook so much. It makes me so happy to be able to play around with ingredients to satisfy my craving. Don't be scared, play with your food! 1. Marinade the beef with salt, ground pepper, and oyster sauce. Just a little bit of everything. 3. Add a sprinkle of salt to the cabbage and carrots. Use your hands to lightly squeeze it, this will take out some of the moisture. 4. Heat up 1/2 tablespoon of cooking oil and sauteed the beef to your liking. I prefer not to cook mine all the way, about medium rare. Let the meat cool down. 5. Prepare the sauce by combining 1 tablespoon of fish sauce, 2 teaspoon of vinegar, and 1/2 tablespoon of sugar, and sliced chilis. 6. 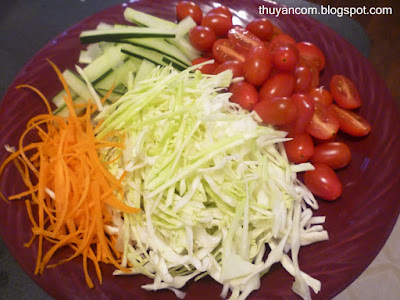 Add tomatoes and cucumber to the cabbage mixture. Toss everything together with the fish sauce. 7. 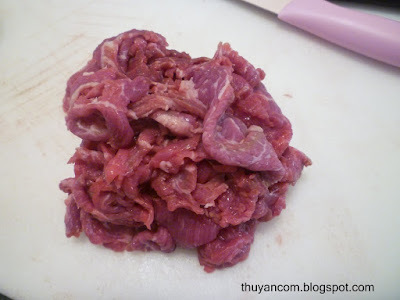 Add the sauteed beef right on top and squeeze 1 lime over the beef. This should help cook the meat a little bit more. 8. Add more fish sauce or lime to your liking. 9. Toss in fresh herbs right before serving. 10. Sprinkle some roasted peanuts right on top.